RUGBY WORLD: Do you have a nickname? BILLY VUNIPOLA: Billy is my nickname because my real name is pretty long and is tough for people to pronounce. So it’s just something vague like ‘Big Billy’. BV: People without manners. I’m always saying “Thank you” and “Please”. I’ve just passed my driving test so I’m probably too nice with letting people out, but I don’t like it when people are impolite. BV: I’d like to get a uni degree. Hopefully that will give me something to fall back on. I’ll hopefully be starting in January and that is why I passed my driving test, so that I can make it to my courses. I want to do a sports management degree and that’s what I’d like to look at when I’m done playing. Hopefully, if I have a good career, I’ll be able to help out players back home in Tonga. 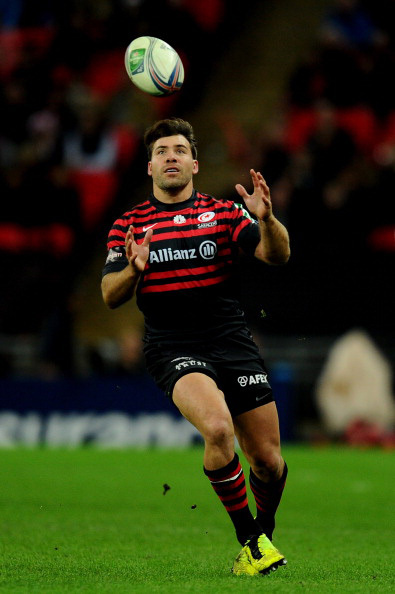 RW: Who are the squad jokers at Saracens? BV: Schalk Brits is a dark horse and Jacques Burger is in denial. He likes to think he’s a serious dude but he’s not. Some of the Sarries coaches, like Paul Gustard, will rip boys in meetings. And no one ever knows what Chris Ashton is talking about! BV: The MRI scanner! I’m not claustrophobic, but in there I get sweaty. My shoulders touch the sides, my nose touches the top and if you fall asleep you’re in there for an hour and a half. BV: I’m quite a good singer actually, I’ve got a decent voice. RW: So what’s your go-to karaoke song? BV: Proud Mary by Tina Turner! BV: I’m probably only saying this because I watched Avengers Assemble the other night, but the Hulk, Thor and Serena Williams. The first two don’t get on, or they didn’t in the film, so it’d be cool to see them together, and I’d like a companion to watch the fight with. BV: The Rock. He’s pretty ripped, so he’d probably not have to change that much! He’s an islander, so he would understand that side of things and he is a big boy. We’re similar in two sorts of ways. BV: Teleportation would be good. You could fool a few people and if I wanted to go to Tonga I could think of a happy memory and be there. RW: Who’d you like to be stuck in lift with? BV: Scarlett Johansson. Don’t get me wrong, she’s beautiful, but not to put a move on her – though she’d probably make a move on me! It’s because she is always playing smart, action roles and is pretty handy. She’d figure out how to fix the lift. RW: What are your guilty pleasures? BV: Oh, I’ve got loads mate! Takeaways, chocolates, all the bad stuff. Well, all the good stuff! Saracens have opened my eyes about professionalism, healthy living and eating right. RW: Ever bought anything really silly? BV: I had a cheap version of the iPod Touch. I saved up all the money I got from my parents to buy it and it broke on the first day. I hung onto it for six months but it had no tunes on it. This was published in the January 2014 edition of Rugby World. Click here to see what’s in the current issue.